Trouble dialing conference calls on the go? Let this app dial your calls, room #'s & passcodes for you w/o entering the app! 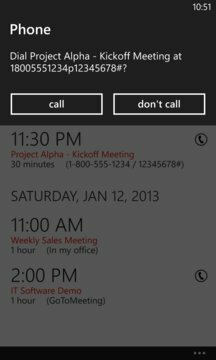 The Live Tile (with auto-dial next call) feature powered by Calendar Sync will automatically scan your calendar for you next conference call & update your LIVE TILE. Tapping the tile dials your meeting phone #, bridge/room #, and passcode! Conference Calleague also supports creating your own Call Profiles. Browse existing contacts, enter phone #'s, & configure your pauses/passcodes/extensions. 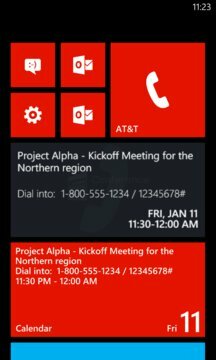 Pin your profiles to the start screen, & tapping the tile initiates the call!